Randy Caballero offered a fight against Diego De La Hoya on the Canelo-Golovkin undercard. Fresh off an injury that forced him out of a June 30 assignment against Oscar Negrete and ready to approach another fight on his road back to a world title, Randy Caballero gets a call this week from his promotional outfit, Golden Boy Promotions, who offers a bout against the head of the company’s cousin, Diego De La Hoya. Caballero, the former IBF bantamweight champion, was told the fight would appear on the televised portion of this year’s mega-bout against Saul Alvarez and Gennady Golovkin on September 16, 2017 in Las Vegas. The 26 year old fighter was asked why he thinks De La Hoya, himself a bantamweight division contender and also fighter under the Golden Boy Promotions banner, would decline the fight. The fight would bolster the PPV pay per view and would bring another story line to the event with a Mexico v. Nicaragua showdown between two undefeated, action fighters on Mexican Independence Day weekend. Caballero, (24-0, 14KO) began his career in 2010 and by 2012 was climbing up the title rankings, winning minor titles before going overseas on October 25, 2014 to take on IBF champion Stuart Hall in Monte Carlo, Monaco. Caballero dominated Hall, knocked down Hall in round two and scored a definitive unanimous decision win by the scores of 116-110 twice and 118-110. The Coachella Valley, California native was then required to undergo a bone transplant on his left heel to remove a bone cyst. Once he was recovered, Caballero was to make his first title defense against Lee Haskins on HBO in Las Vegas, but missed weight and was forced to vacate the IBF belt. Caballero then had some time away from the ring recovering and re-negotiating his terms with Golden Boy Promotions. Re-signing with GBP in late 2016, Caballero returned to the ring in March 2017 against Jesus Ruiz as the main event of a ‘Golden Boy Live’ card televised on ESPN. Ruiz was no walkover as Caballero had his hands full over 10 entertaining rounds in his backyard of Indio, California inside the Fantasy Springs Casino. Caballero was set to again headline a Golden Boy Live Event in June against Negrete before being forced out due to injury the week of the fight. 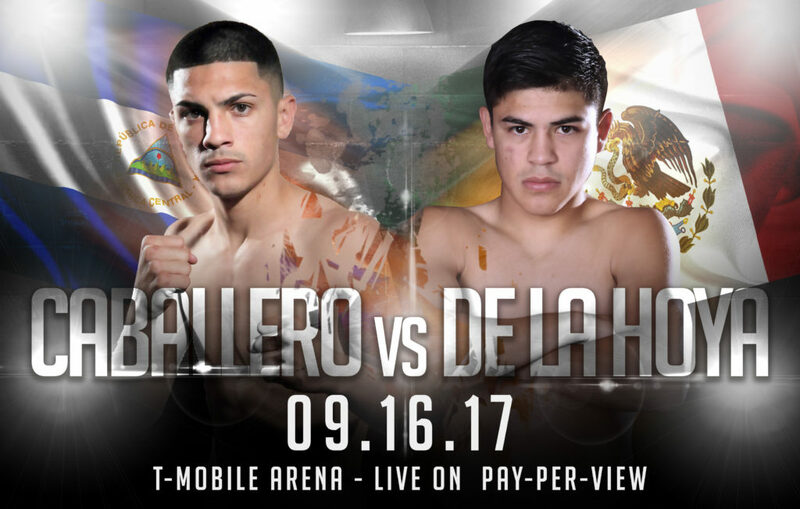 Now cleared, ready and willing to once again punch for pay, Caballero has his sights set on a September showdown with DDLH. A win over De La Hoya, who is fresh off a win over Alan Isaias Luques Castillo for the WBC’s youth world super bantamweight title, could turn into an eliminator bout for a challenge at the full version of the title. Caballero has seen much in his career and has been to the heights of the sport, as well as the bottoms of the sweet science’s pitfalls. Caballero is gracious when speaking of his relationship with Golden Boy Promotions, yet doesn’t hold back on his feelings about Diego De La Hoya’s upbringing in the sport. Having the same promoter, fighting amateur and professional bouts at or near the same weight, sparring and bad blood boiling with De La Hoya for years aside, Caballero believes nothing else matters once a fight is set.